We had no Chevy to drive to the levee, as Don Maclean sang about in his classic Miss American Pie, but we did get to drink whiskey at the Cape Grace’s Bascule Bar – and felt vaguely like Good Ole Boys by doing so! Veteran of the whisky scene Dave Hughes led the tasting. Light, delicate nose with hints of rose petal, sweetcorn and gentle vanilla backing. Subtle hints of orange, almond and coconut. After the delicacy of the nose the big ﬂ ow of ﬂavour comes as quite a surprise. Vanilla and toﬀee suggest sweetness but it’s actually very dry. There’s a sweet/ sour note and slight rye character. Long, yielding ﬁnish with slight oak character. Gentle spice adds some complexity while the toﬀee reasserts itself in a ﬁnal ﬂourish. Novices: Shayne enjoyed the appeal of this one while Editor Fiona McDonald noted an almond and biscuit note on the palate with a vague minty aftertaste. Firmer, fuller nose than the white with more distinctive vanilla aromas and slight minty note. Also a trace of treacle. More expansive in the mouth with big oaky lift which emphasizes the vanilla while giving a sweet, spicy sensation. A slight toasty, smoky note appears after a while. Long ﬁnish with all the aromas presented again. Soft and gentle throughout. Easy drinking yet full and luscious. Novices: Digital editor Marsh Middleton noted honey on this while Charlotte found it heavier and richer, more spicy than the ﬁrst. (Odd name comes from the Kentucky town where Abraham Lincoln’s father was born. Thomas Lincoln was a worker in the local distillery.) Distinctly oaky nose with biscuit, cinnamon and apple followed by some delightful savoury notes and just a slight suggestion of tobacco. Big and bold in the mouth with developing sweet sensations set up by intense oakiness. Loads of spice where white pepper is prominent. Great balance of grains. 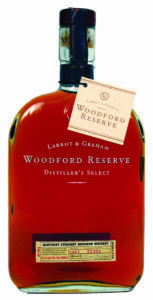 Toasty oak features in fairly long ﬁnish with ever present vanilla, brown sugar and spice. Very attractive bourbon with great balance. Novices: “Quite strange for me,” said Marsh. “Almost salty and meaty with a Marie biscuit and coﬀee bean character. Heavy savoury notes.” Charlotte found it balanced with good creaminess and a coconut nuance. Initial nose is fairly robust yet settles down into delightfully gentle perfume with fruity notes of caramel and ginger. Also touches of citrus, apple and barley sugar. A slight leathery note creeps in towards the end. On the palate there’s a light, fruity delivery with distinctly nutty dryness and full sweetcorn character coming in as the peppery oak develops. Some spicy rye notes also come into play. Hints of cocoa lead into the long, lingering ﬁnish. Exceptionally smooth and satisfying. Novices: “This smells of the sea to me,” said Megan while Charlotte found wood varnish and thatch. Shayne commented on the bags of citrus and Steven enjoyed its subtlety, smoothness and complexity. Enticing ripe fruit nose with almond, peach, plum and vanilla with full oaky backing. Later some ripe banana aromas develop along with licorice and decided corn notes. Full, bold and complex in the mouth with soft, mellow elegance. Great soft corn character. The toasted oak develops and more vanilla becomes apparent. Hints of caramel and malt eventually show and lead to a long ﬁnish where some spicy rye notes come into play. 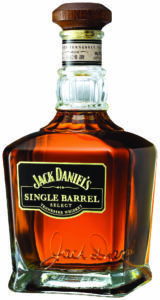 Distinctly “Jack” type of fruity sweetness. Long and eminently satisfying. Novices: “A standout for me,” was Shayne’s instant reaction. Charlotte had a ﬂashback to childhood, ﬁnding milk bottle sweetie appeal. “Reminiscent of a Japanese whisky,” said Marsh who also liked its clean disappearing act. Full fruity nose with mebos and apricot, sweet toﬀee and some minty aromas. Big and full in the mouth with massive ﬂ ow of vanilla followed by grains and honey. To my taste a very traditional American character! Full, rich and robust with fruit cake, brown sugar, hints of rye. Oak develops in the glass and after all the power on the nose and in the mouth has a great smooth ﬁnish. Attractive hint of clove right at the end. 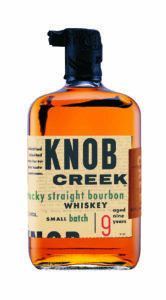 This is the kind of Kentucky bourbon that has the great American character. Novices: “Didn’t blow my skirt up,” was Megan’s pronouncement as she found it quite hot and spirity. Something Fiona agreed with was the alcohol hit which was a bit numbing on the tongue. George Novitskas was a fan, ﬁnding huge toﬀee, apricots and almost sherry-like ﬂavour.